As I have stated many times before, I am from Long Island, NY. Being that I am not a native Midwesterner I am curious about the surrounding states. While growing up on the East coast I visited Pennsylvania, New Jersey, Vermont, Maine, Maryland and so many others but other than my trip driving here and a brief trip to Michigan I have yet to explore my new "Home". I have been bugging Shane to take me to Wisconsin as there are many places I have wanted to see, and I hope one day I can live my "Lavern and Shirley" fantasy in Milwaukee. But until then Shane stays put and I needed my incredible friend Cheryl (who is from Wisconsin) to take me under her wing for a brief tour of Wisconsin and taste some of it's beer and cheese! We left early on Labor day weekend and our first stop was Madison and its glorious and beautiful farmers market that surrounds the capitol. Unfortunately it started raining when we got there but we still were able to walk around (and get soaked!) and taste many things from the market and soak in the fresh produce...Cheese curds! 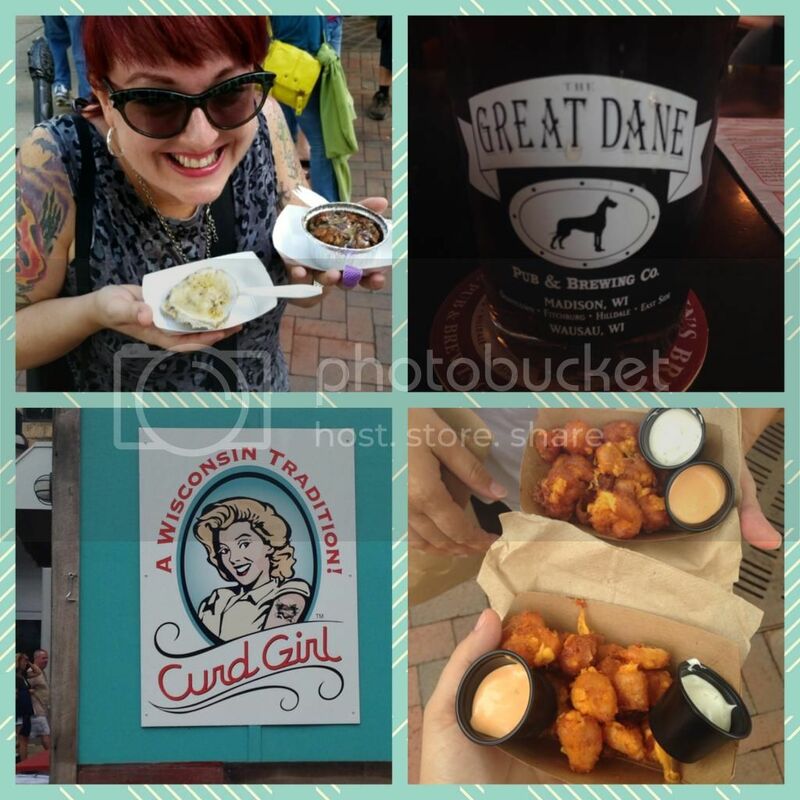 The "Taste of Madison" was also going on that day so after shopping and wandering we stalked the "Curd Girl" booth for more (and better) cheese curds as these were fried up and served with amazing sauces! We also popped into "The Great Dane" pub for a quick beer, because when you are in Wisconsin, you drink beer...even at 11am! After leaving Madison we had a long drive to her Sisters house. 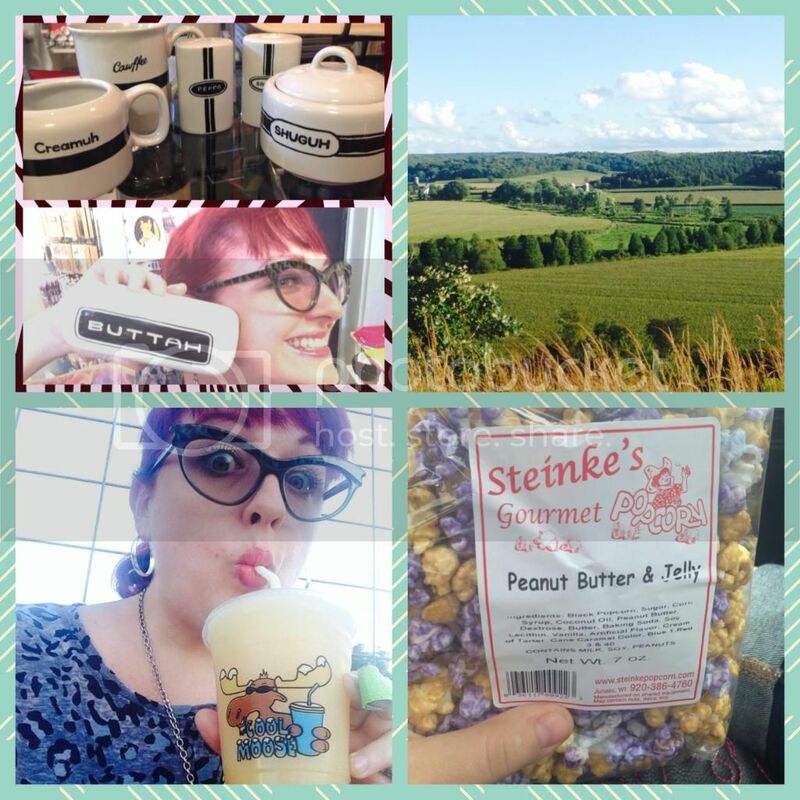 We had fun thrift shopping, stopping at farm stands and enjoying that tasty frozen cider, snacking on this crazy popcorn I found at the farmers market and enjoying a scenic overlook. See that ceramic stuff up there? I regret being good for once and not getting it. I found it at a shop on State Street in Madison. Its by "Fishs Eddy" and this is their Brooklyn line. Cheryl thought she was so funny making fun of my accent when she found these. 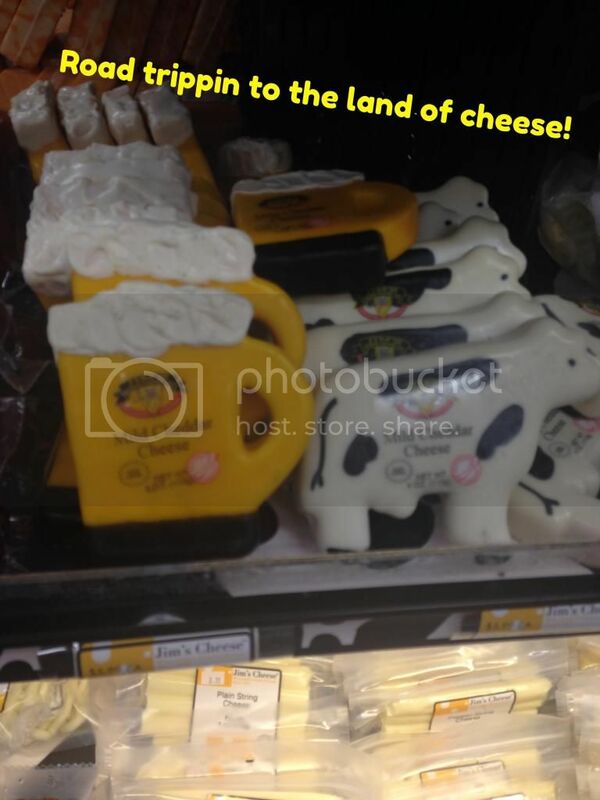 I may need to go back and get them....and eat more curds! The rest of the weekend was spent relaxing at her sisters house. Where we were mostly everything is closed on a Sunday and that was ok...after her sister and friends "forced" me into a drinking game on Saturday night I was in no shape to do anything BUT relax! On our way home we got to cross a MAJOR thing off my Wisconsin "Bucket list" and that was the "House on The Rock". I was so happy it was open as it was Labor Day and so many places were closed. There are no words for the madness that is inside this place. A very rich and eccentric man collected a ton of crazy stuff and put it all into this huge house. Part of the house is built in rock, there is an infinity room that stretches out far with few supports (which I read AFTER I walked in there) and just collection upon collection upon collection upon collection....dolls, crazy organs that play, a million carved ivory tusks and just insanity. I swear my brain hurt for days after leaving here. When something is crazy to me, its REALLY crazy. But AWESOME at the same time. 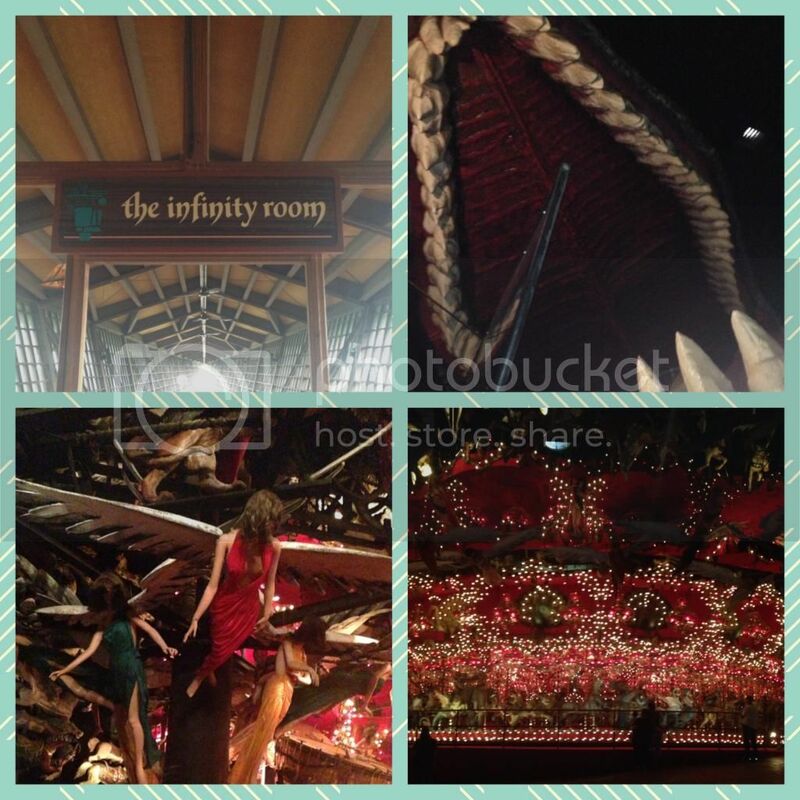 When I got to the room with the huge carousel inside, Cheryl said my mouth was hanging open in awe and I was silent. I am never silent...the HOTR made me speechless. It is worth a road trip, pictures and explanations do not even touch what this place is. Its's a must see to believe. 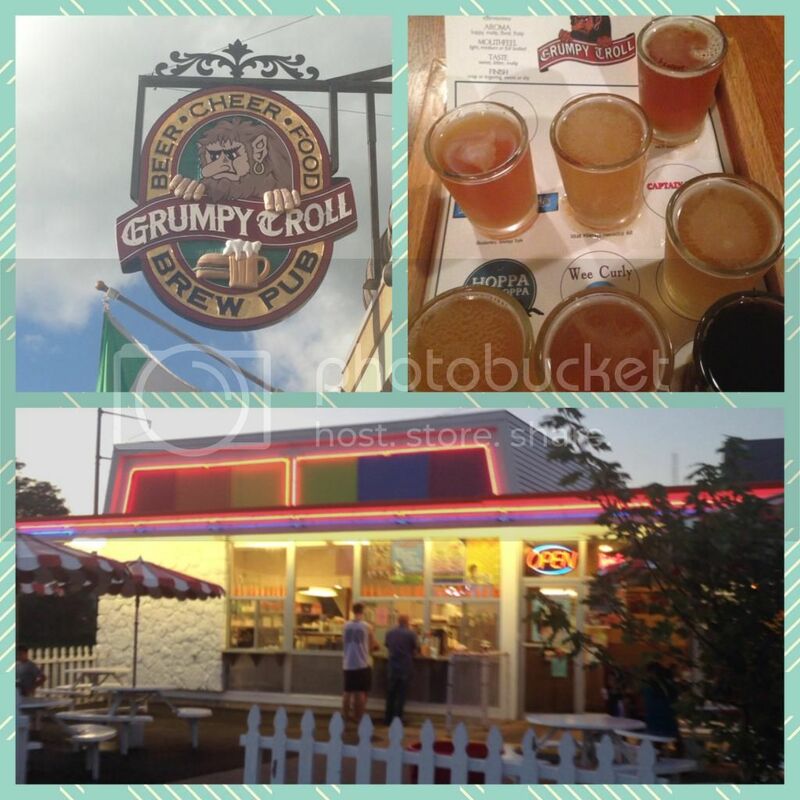 After the house we were hungry and since the brewery I wanted to go to (New Glarus) was sadly closed, Cheryl ended up surprising me and taking me to a town that is known for TROLLS (yes, trolls...wooden trolls EVERYWHERE!) and a tasty pub there called "Grumpy Troll". Even though we were full we still stopped at this tasty ice cream place because in Wisconsin you have some ice cream! Boy did I eat so many veggies when I got home! P.S. 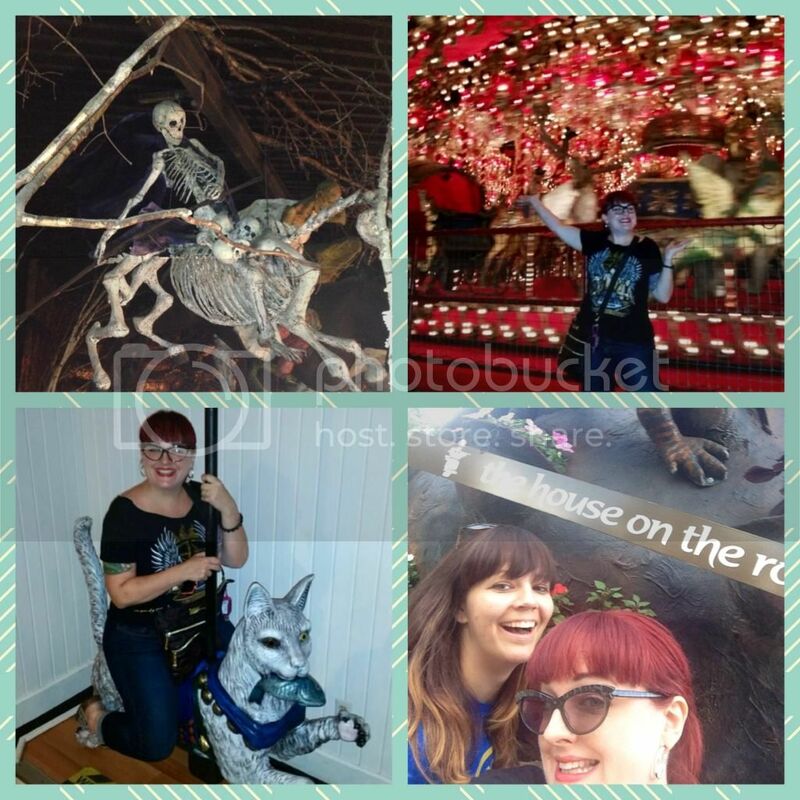 You can check out Jen's trip to House on The Rock in 2012 here, too!